Packing for a family summer holiday is a job that is often dreaded - but needn't really be that taxing. Packing for yourself can be fairly straighforward and simple, but when you have to make sure you have everything you need for the kids as well as yourself, it's a lot more tricky. Lugging five enormous suitcases for a week-long family holiday to Mallorca will weigh you down and make travelling all that more difficult – especially when two suitcases (with wheels) will do. Unless you have 12 kids, packing light is packing right. As a rule, three changes of clothing per person is more than enough (with a few extra socks and pants thrown in). If you are staying at a villa or holiday home, find out in advance if there is a washing machine and dryer at your destination, and bring along your own washing powder if you or your children have sensitive skin/eczema or allergies. If there are no washing facilities, you may have to bring extra clothes - or be prepared to wash items by hand. At least one nice outfit for evenings out- more if you like to dress up! Any other specialised clothes (rock-climbing gear, camping gear, rainwear etc). When packing, it is always a good idea to pack once, then come back the following day and pack again. Do this several times and keep knocking off things you and your family don't need. If you are going someplace where the shopping is cheap and fun – and you like to shop – take even less and plan to wear the newly purchased items. If you are flying, be aware of luggage allowances and make sure your luggage conforms to all size and weight specifications, including hand luggage. There's no need to pack the entire contents of your bathroom, so try and consolidate everything your family needs. Grown-ups and children can share soap and shampoo, and the children's moisturiser should work equally well on adult skin. However, you may need to take extra medicines - just in case - depending on where you go and their availability. 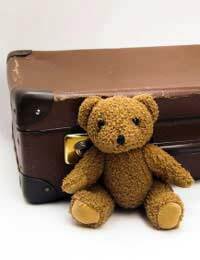 If you have little ones, find out what items will be supplied before you go. If there is a cot, highchair, baby bath and cot linen, all you need is a steriliser. Learn in advance if you can buy baby food there or what you will need to carry with you. Same with nappies. Why cart around three boxes for a two-week holiday to Spain, when they sell decent ones at the local shop? Give each child aged three and over a backpack small enough for them to carry comfortably and have them fill it up themselves with things to keep them busy en route. Colouring books, crayons and a cuddly toy are good for young kids, older ones may want books, Nintendos and iPods in their backpack. If your summer holiday is abroad, make sure your passports, tickets and other travel documents are all together in one safe place - and make photocopies of them before you go, safely behind with a friend who is easily contactable. Some people swear by "rolling" their clothes in small bundles inside their suitcase rather than folding them, saying it is both easier and a great space-saver. If you roll clothes in tissue paper, they will appear less wrinkled when unrolled.